LEADING wine company Yalumba has quickly distanced itself from the controversial US National Rifle Association after it was revealed it was one of 20 Australian producers sold on the group's wine club. The privately owned Barossa Valley company will begin moves immediately to track how four of its wines made it onto the NRA's profit-making club, boss Robert Hill Smith said. He did not want Yalumba associated with the the powerful pro-gun political lobby, even though it was a legal entity. "Philosophically, I'm not disposed towards the NRA, which runs counter to my family's, and I would think all my employees', positions on gun laws," Mr Hill Smith said. "We will act to withdraw our stock or at least not service the account any longer." The NRA's wine club list was highlighted to the Australian industry yesterday via social media, revealing that 20 producers were included in its international list run by a third party Vinesse, which manages wine clubs for a range of US enthusiasts. The revelations unleashed a range of reactions after it became clear profits from the NRA wine club sales supported the group's controversial stance to fight for Americans' right to own and carry guns. The association has been in the spotlight in the US as President Barack Obama has vowed to take action on US gun laws during his second term. The wine club's profits go directly to the NRA's campaign, according to its executive vice president, Wayne La Pierre. "Your purchase will directly benefit the NRA's continuing support of America's right to keep and bear arms and the other basic freedoms of the American culture," Mr La Pierre says on the NRA's website. Leading Australian producers also on the wine club listings include St Hallett, Jim Barry Wines, d'Arenberg, Tahbilk, and Primo Estate. Companies contacted by News Ltd yesterday were unaware their wines were being sold to profit the NRA. "It's five steps removed from when I sell the wine," Jim Barry Wines boss Peter Barry said. "No matter religion, colour or creed, I'm just happy people are drinking and enjoying Australian wine," Mr Barry said. "I've never thought about where the profit goes," he said. Distribution in the US is a complex issue, peak industry body Wine Australia chief executive Andrew Cheesman said. "We'd encourage producers to work closely with their importers to fully understand their channel strategies and to ensure they're fully aware of where their wines are being sold," he said. I'd say that the nra should quit selling the aforementioned wine because it is not "vinted" by people of the same opinion of nra members.Boycott all of those wines that are anti 2A! I've seen Yolumba wine on the shelves here in the UK. It can stay there as there are plenty more producers who don't have an attitude problem. Yalumba Wines is now off my shopping list. As Radar said...nice wines...and now the silly buggers have "shot themselves in the foot". I dont like their wine anyway..
LoL. No big deal bushy, I do like wine, but not Yalumba. Interesting...I received a reply from Yalumba to an email asking them to confirm their stance on firearms ownership. Seems they are not anti-firearm, but they don't want to get caught up in an argument in US politics. I can understand that. It seems that it is a case of a journalist up to their usual trick of not letting the truth get in the way of a story...and I have a very strong gut feeling that the ANTIs (have a look at the first two tweeters in the attached pic) have an involvement in it as well. This is all a slight beat up ! I too am a firearm owner---my grand fathers shooting/hunting guns for quail and roos are in a registered family lock up. Whilst I was ambushed late Friday before a long weekend having no lead up knowledge of the TWITTER issue which evolved as shown below, I had little idea of the fervour it may create. I then went off to Kangaroo Island fishing ! My full discussion on the phone to tony love the local advertiser wine writer will never be reported but I pointed out the NRA was a legal and popular entity and effective lobby group and whilst I was not fond of their politics we are not entitled or wishing to get involved in any argy bargy. People are passionate, and that is their right to be so. It’s the USA and we are here making wine from 2013 grapes. We sell our wines to a distributor whom then services the trade. Below is a cut and paste from the internet. 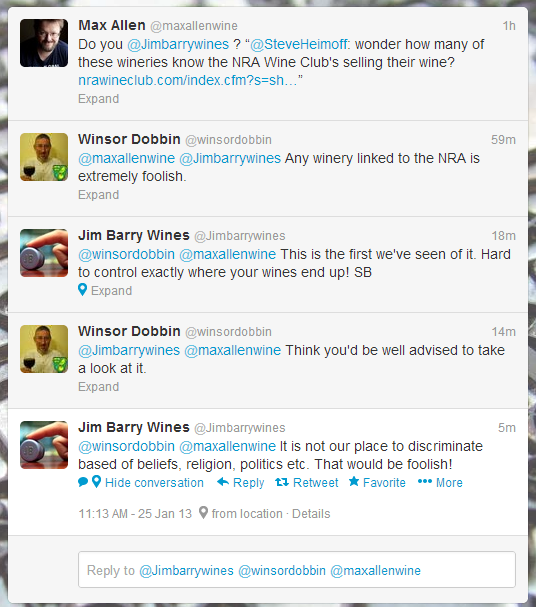 The NRA's list is run by third party Vinesse, which manages wine clubs for a range of US enthusiasts. The association has been in the spotlight in the US as President Barack Obama has vowed to take action on US gun laws, in response to shooting massacres, during his second term. The wine club's profits go directly to the NRA's campaign to have the right to own and carry guns, according to its executive vice president Wayne La Pierre. ``Your purchase will directly benefit the NRA's continuing support of America's right to keep and bear arms and the other basic freedoms of the American culture,'' Mr La Pierre says on the NRA's website. Leading Australian producers also on the wine club listings include St Hallett, Jim Barry Wines, d'Arenberg, Tahbilk, and Primo Estate. Estate. Companies contacted by News Ltd yesterday were unaware their wines were being sold to profit the NRA. Hope this settles the issue. I am not an evangelist..I hope you keep enjoying our wine..First grapes in today at Yalumba. I dunno it's like the guy said 5 steps removed from when he sold it. If I sold a piece of furniture that I built and 5 hands down the road it was auctioned for some org. I don't agree with, I don't think I'd give a darn, just happy to get my money out of my project. If he doesn't want his wine sold that way he should state it on the label, like "Not for sale to further the cause of the rights and freedoms of others". That should do it. It sounds to me like (most) of the organizations that make wine in oz are/or have been indoctrinated into believing that the nra is an evil organization!Where has this mindset comefrom?But it is okay if they don't want to sell their wine to the nra any longer-the PNW has lots of silver and gold medal wines! And strange but now some belgian army joke crossed my mind: some day they put a big sign in the their bar saying "alcohol kills!" a few days lather somebody wrote a sidenote on that sign: "belgian soldiers don't fear death!"